On today's blog we look at how beavers in the Forest of Dean are settling in to their new home, and badgers in hot weather. 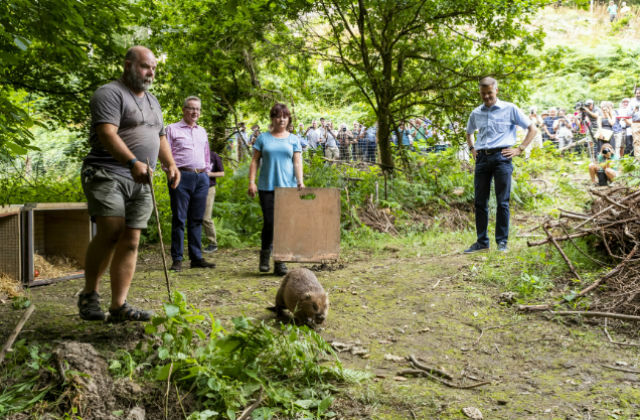 There has been further coverage of a pair of Eurasian beavers settling into their new secure enclosure in the Forest of Dean with the Daily Mail, Daily Telegraph, Daily Express, Guardian, Independent, BBC News and Gloucestershire Live all reporting the story today (25 July). A video is available to watch online of the Environment Secretary’s visit to release the pair into their new lodge and he welcomes the reintroduction. It’s an amazing thing to think that hundreds of years after we thought they were extinct, we are reintroducing the Eurasian beaver here into the UK. BBC Points West reported that a local contractor had to erect two thousands metres of fencing on 15 acres of land. This project is really important, because it shows that we can use nature itself, both to reduce the risk of flooding in the future. But also bring back wildlife to this very precious environment. Beavers can change the way in which our rivers work, so for example we can see the return of water voles and other animals as well, and nature can reclaim what is truly hers. Several media articles have reported concerns about badger control in the current hot weather, such as Politics Home. Badger control has been authorised in two areas so far this year and strict measures are in place to ensure all culling operations are carried out in the most humane way possible. Contractors have been reminded to check traps early in the morning before temperatures rise and to stop trapping if there is a risk badgers could suffer in the heat. Natural England (NE) is carrying out monitoring checks to ensure compliance. NE also publish clear best practice guidance to ensure culling is as humane as possible, and contractors are trained to deploy traps within cover to mitigate against exposure to hot or cold weather.